ABCDF: Any body can drive Ferrari! In India, we can drive BMW and Mercedes for hourly/daily rental under self-drive scheme. But Myles/Zoom haven’t added a Ferrari/Lamborghini yet to their fleet. On my Day 1 at Singapore, I went to check out Ace Drive SG, who have a fleet of luxury cars for rental. More about them in a separate post. Subsequently, I spotted that another agency called Ultimate Drive has a Ferrari and Lamborghini on 15/30/60 minute rentals. 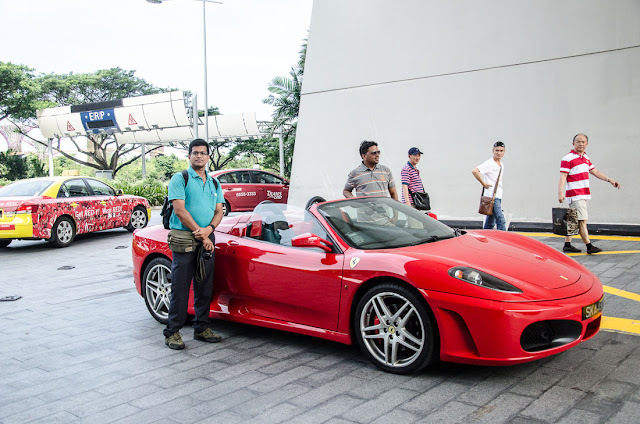 (Dhananjay Murthy and few other facebook friends also tipped me on this) This post gives more details about renting the Ferrari/Lamborghini from Ultimate Drive and why I resisted my temptation to rent one. Another company called Dream Drive also offers similar supercar rental schemes. If you have 15000 INR to spare, you can ride a Ferrari or Lamborghini in Singapore for 15 minutes. At various places- such as Marina Bay Sands, Suntech Mall etc there’re counters offering this dream ride for a fee. We saw these cars on offer- once at Suntec mall and again at Marina Bay Sands. The cost of ride were as follows (below rate is when you book on Ultimate Drive's website. Spot booking costs about 15 dollar more. If you (and say your friend) book both Ferrari and Lambo for an hour each together, you get to swap the cars halfway and get to experience both cars. But you can't book for an hour and share with four friends for 15 mins each. If you don't want to drive and just want to be driven, it is a bit cheaper, but then which car enthusiast would opt to sit in co-passenger seat when he/she can drive it for a few dollars more. As long as you have a driving license written in English, of any country, you can drive in Singapore. Apart from this, you can also buy t shirts, miniature cars and other merchandise. If I am spending 15000 Rs for 15 minutes, the best time of the day would be early morning, say 6AM, when traffic is very less. But these guys (Ultimate Drive) open only at 9 AM and close at 10 PM. So I can't take advantage of off peak hours. These cars have only 2 seats. If you sit in one, another seat is taken by the staff. So your friends/family can not enjoy the ride. There're many super car owners in Singapore who are frustrated at not being able to drive their supercars at high speeds. Unlike Europe where there're umpteen number of highways and autobahns to cruise around, Singapore feels like a confined space. I feel it will be good if city administration can identify say 10km of straight road and declare it as super car lane, at least for some part of the day where high end car owners can enjoy a high speed ride. It was a tough decision NOT to book on the spot and go for a quick ride. If I could extract full potential of the car, I would have probably booked and driven it. But didn't want to spend knowing above limitations. But may be next time or some other day/some other city, I will be driving the Ferrari for sure. I appreciate this initiative where everyone car drive their dream car. 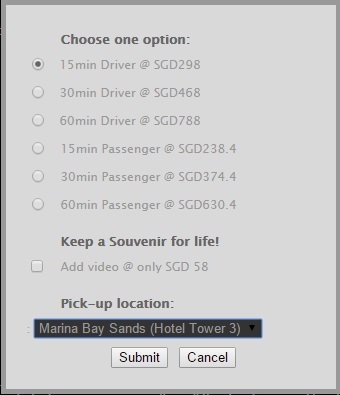 Try it out next time when you visit Singapore. Maybe some other time some other place!! I shall await that review! All the Best!!! Hope your Dreams come true.